BALTIMORE – The Dow rose 126 points yesterday – just shy of 1%. Not enough to reverse the market’s apparent downward bias. Stocks are most likely headed down because the thing that sent them up has come to an end. The chart Chris showed you in yesterday’s Market Insight tells the tale. Here it is again, in case you missed it. 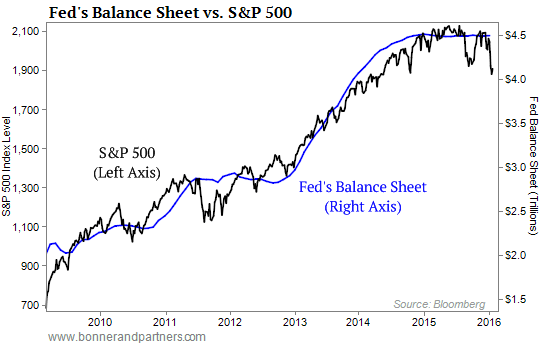 As you can see, over the last six years or so, gains for the S&P 500 have closely tracked the ballooning of the Fed’s balance sheet under QE. After shelling out almost $4 trillion on bonds, the Fed’s QE is on pause. And stocks are struggling. We stuffed a few copies of the Hindustan Times in our bag before boarding the plane back from Mumbai. On the front page, French president Francois Hollande is receiving an awkward hug from India’s top man, Narendra Modi. Over in the entertainment section is another note of interest. Actress Julie Gayet has put together a film production company. And lucky for her – she has backing from one of India’s biggest conglomerates, the Reliance group. Nowhere does the paper mention that Ms. Gayet is Mr. Hollande’s main squeeze. She is the woman for whom he snuck away on a motor scooter from the presidential palace, where he lived with his then First Girlfriend, journalist Valerie Trierweiler. Reliance is owned by the Ambani family, which lives in Mumbai in the most expensive house ever built. It is 60-story skyscraper, put up at a cost of $1 billion, which now takes a staff of 600 to keep the furniture dusted. No mention was made of how Reliance may benefit from any of the French investment. But Mr. Hollande’s deepening ties with India… and Ms. Gayet’s deepening ties with Mr. Hollande… can’t have hurt the former TV actress’s bid for funding from one India’s most powerful and well-connected families. U.S. Marine Corps Major General Smedley Butler – who twice won the Medal of Honor – knew war far better than most. “War is a racket,” he wrote. But it’s the Deep State’s favorite racket – partly because there is so much money in it… partly because its main mission is to protect the Deep State’s own elite… and partly because the typical citizen never catches on to what a racket it is. The heart has reasons reason cannot reach. Man is badly designed. Not in every particular but in a few. That insight comes not as a theoretical point but as a bit of practical information. Sketching out a man’s internal plumbing on a piece of prescription paper, Dr. Moreau of the staff of the American Hospital’s emergency room revealed a design flaw. What a strange thing: The same God that built such an exquisite universe seemed to have lost interest when he got to man’s entrails. For there, on the left side of the intestinal tract, is a little appendix – with no role except to create problems. And then, down below are various tubes and passages. Had one of them been made just a little more commodious… I would have been spared a visit to the American Hospital. He was pointing to the range of lower vertebra. After years of heavy lifting, the cushions between the bones have been worn down. “You must have lower back pain from time to time,” the doctor noted. It is not our place to carp and criticize. But it would have been nice if the manufacturer had installed more durable cartilage in the 1948 models. And more flexible tubing. What had set Sylvie off was neither my plumbing nor my neglect of the subjunctive, but my thoughts on war and peace. 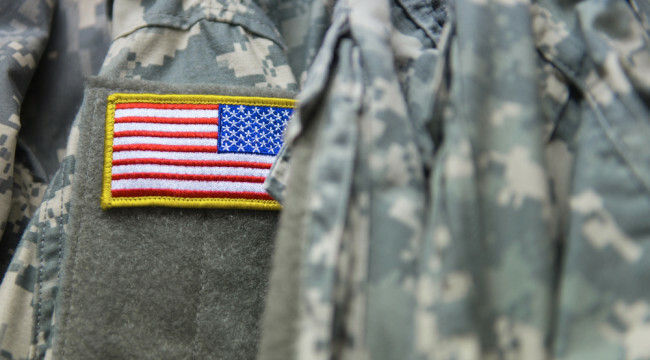 “Almost every war Americans have ever fought turned out to be a mistake,” I had told her. I had taken her on a brief tour of American military history. Every war had its “reasons,” but they were all absurd. What about the War Between the States? If it was fought to get rid of slavery, it was a poor way to do it. Slavery disappeared from the rest of the world with hardly a single fatality. And if it was fought to “Preserve the Union,” it was a fraud. Said union was founded on the principle that people could decide for themselves what government they wanted to plunder them. “As for the Spanish-American War, who knows why it was fought. And who cares? “Yes. But what was the point? “If the U.S. hadn’t pumped in so much money, war material, and then soldiers, the war probably would have ended sooner. And much better. “By 1917, both sides were nearly exhausted. They would have had to negotiate an end to the war. But the entry of the U.S. gave the Allies ammunition and the Germans targets. “The U.S. encouraged the British and French to believe they could win the war, so they wouldn’t have to accept a negotiated settlement. “The average American couldn’t have cared less about the Archduke Ferdinand. He had no idea who Ferdinand was… or where he stood in the pecking order of European politics. “He was as ignorant of the Austro-Hungarian Empire as he was of the contents of Austrian sausages. An American of sound mind and decent judgment would have just as soon seen the Archduke stuffed and used as a parlor ornament as revenged. “But once stirred up by the press – and the big idea of ‘making the world safe for democracy’ – he was ready to enlist and get himself blown up believing that he was protecting Western civilization from the invading Huns. “World War II was an exception, from a U.S. point of view,” I continued. “The U.S. was attacked. Japan and Germany declared war on the U.S. It made sense to fight back. “You’re right, of course. War doesn’t make much sense. In 1910, British author, journalist, and politician Sir Ralph Norman Angell (who later won a Nobel Peace Prize) convinced many of the world’s leading intellectuals that war was a thing of the past. His argument was reasonable, logical… and, of course, ridiculous. But you, dear reader, are already in on the secret – reason is no rampart against imbecility. Man, with his power of reason, is badly designed. Since he is able to reason, he imagines that the world – and he himself – acts the way it thinks reasonable. But as often as not, reason merely leads him into absurdity. “War is costly; therefore, it will be short. The Germans want to crush the French as quickly as possible so they can turn their attentions to the Russians. “The Austrians want to get rid of the Serbians as fast as they can so they can turn to face the Cossacks. The Russians must get to the front as soon as possible so they can relieve France. “Our soldiers leave and leave gaily,” reported French newspaper Le Figaro on August 2, 1914. “We’ll be back… It will be over quickly,” a group of infantrymen told a reporter from another French rag Le Temps. It was widely believed that – like a barroom brawl – the war would be quick and violent. There was no time to wait… no time to think… no time to second-guess. It was time to throw a punch. And why not? The war would be over quickly. Why hold back? The logic was impeccable. If the war was to be swiftly decided, the winner would be the one who brought to bear the greatest force of arms the most quickly; holding back could be fatal. General Grandmaison was a real thinker. But his thinking couldn’t make the world behave as he thought it should. He believed in “attaque à outrance” – best understood as an excessive or reckless attack. It was just such an attack that got him killed in one of the first battles of the war, at Reims. The war continued for four long years. The final outcome was determined not by the initial attacks but by what was held in reserve: manpower, material, and money. And although the patriotic élan of the soldiers may have made their countrymen proud, it was the profit motive of the bankers and manufacturers in London and New York that decided the outcome.